Kile Pletcher’s life is surrounded by numbers. Numbers lining the football field of the sport he loves. Numbers that he uses while calculating interest and other formulas in his chosen major of finance at Southern Arkansas University. And two final, yet vital, numbers that stare him in the face: one and four. As in one career change before even receiving his degree. And at least four more years of school. Kile, a 2014 graduate of Magnolia High School, began college as an accounting major but changed to finance. About halfway through his college career, he began to think about adding another line of study – pre-medicine. While growing up, childhood illnesses required Kile to visit Arkansas Children’s Hospital. Those visits left a lasting impression, and over the years Kile began to think more and more about becoming a doctor. Another number that indicated he would be able to handle the extra class load was 4.0, which was his grade point average until last spring when he received his first and only B during his college career. Kile began taking pre-requisites for medical schools along with his business classes. Then last spring while planning classes for the fall, a new opportunity came his way – an internship at Magnolia Regional Medical Center (MRMC). Mrs. Jody Nations, instructor of accounting, Mrs. Megan Whitehead, instructor of management, and Mrs. Sheila Pearson, director of the internship program in the Rankin College of Business, worked with the hospital to help make the internship possible. For Kile, the internship provided an opportunity to learn about his desired future in medicine and also use his experience in finance. During the first three weeks of the summer job, Kile found himself in various areas of the hospital, often shadowing doctors and learning on the job. During the second half of the internship, he worked on a cost analysis of the cost of surgeries. The summer culminated with Kile presenting his cost analysis report to the hospital. 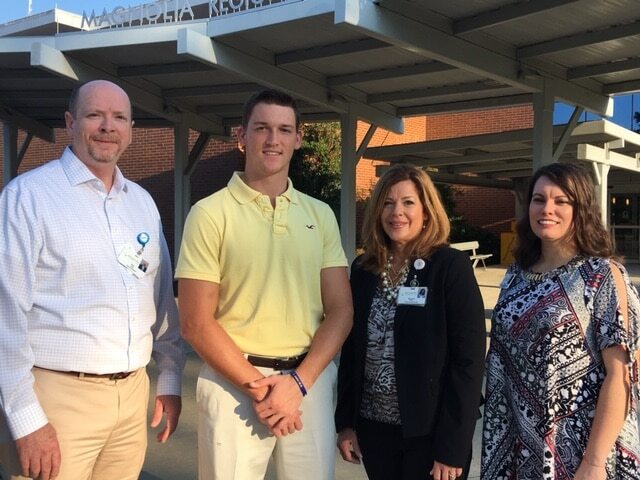 Throughout the summer, Kile attended meetings with the hospital staff so that he could see the medical field from a management position. “They let me do more than I expected. I really appreciate the hospital for letting me do so much,” said Kile. Rex Jones, chief executive officer of the MRMC, was equally pleased with the success of the internship. “I was very impressed with Kile’s work ethic and professionalism,” said Jones. “He’s very conscientious. And we were able to draw on his knowledge for a project we were working on. Kile took that project and flew with it. He surpassed my expectations for an intern. “The internship was a great a great opportunity for us to work with the Rankin College of Business,” added Jones. Kile, who starts as a receiver for the SAU Mulerider football team, said the summer job helped him finalize his career decision. Kile is now studying for the MCAT, and plans to take the exam after he graduates with his degree in finance in December. He hopes to attend medical school in Arkansas, and hopes to follow that by specializing in neurology. “I’m really excited but I’m also nervous about getting into medical school,” said Kile. Kile has already seen success in the classroom, on the football field, and in his initial venture into the career of his dreams. Those three areas give Kile Pletcher a solid background to count on as he sets his sights on the next chapter of his life.